Third-row seating is standard with front-wheel drive, optional with 4Motion. When Volkswagen’s revamped Tiguan sport-ute hits dealer showrooms this summer, buyers will be able to step into the base model for $25,345. That price will get you a Tiguan S with front-wheel drive, 17-inch aluminum wheels, a rearview camera, a 6.5-inch touchscreen infotainment system that’s compatible with Apple CarPlay and Android Auto, and the 2.0-liter TSI engine with 184 horsepower. That checks in just slightly above the current Tiguan, but the new model also comes standard with third-row seating and VW’s new six-year/72,000-mile transferrable warranty. 4Motion all-wheel drive models start at $26,645, which is actually a touch less than the current model. The downside is that the third-row moves from standard equipment to a $500 option on all 4Motion variants. Continuing up the scale, the $29,080 Tiguan SE adds a larger infotainment screen along with a bit more safety tech and some bling to the interior. $32,550 will get you into a Tiguan SEL with 18-inch wheels, a panoramic roof, navigation, adaptive cruise control, and a few other convenience options. At the top of the scale is the SEL Premium 4Motion, packing a leather interior with a full host of driver assists, a 12.3-inch cockpit display, overhead camera, 19-inch wheels, and a $37,550 price tag. 2018 Volkswagen Tiguan | Why Buy? Of course, the new Tiguan is a fair chunk bigger than the current model. Volkswagen says it’s 10.6 inches longer with 58 percent more cargo space, which is why the once-smallish SUV now sports a third row for passengers. All new Tiguan models will use an eight-speed automatic that’s driven by the new turbocharged 2.0-liter mill, which the manufacturer says offers both improved torque and fuel economy. With the company’s full-size Atlas SUV already off to a decent start, it will be interesting to see how buyers respond to the enlarged Tiguan. We had a go in a pre-production model back in May, and though our time was limited to a brief off-road course, we had little to complain about. HERNDON, VA (June 14, 2017) — Volkswagen of America, Inc., today announced that pricing of the all-new 2018 Tiguan will start at $25,345 for the turbocharged 2.0L TSI® S FWD model, and $26,645 for the 2.0L TSI S 4Motion®. Built off of Volkswagen’s award-winning MQB architecture, the 2018 Tiguan features a more modern design with bold lines, a wider stance, and premium interior touches. At 185.1 inches long, it gains 10.6 inches in length over the existing model, and features up to 58 percent more cargo space. Third-row seating comes standard on FWD models, and is optional on AWD models. The new Tiguan offers a combination of both passive and active safety systems such as the Automatic Post-Collision Braking System. 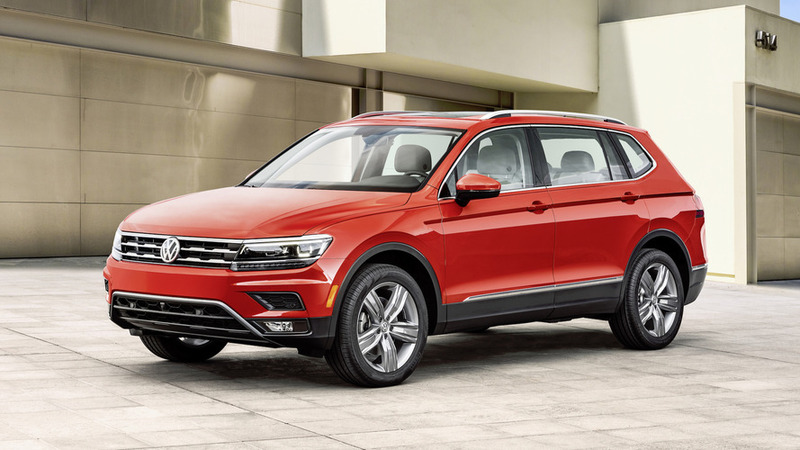 The 2018 Tiguan also carries the best transferable bumper-to-bumper warranty among SUVs in America: a six-year or 72,000-mile (whichever occurs first) New Vehicle Limited Warranty, with coverage that’s transferable beyond the first owner. The Volkswagen SUV bumper-to-bumper transferable warranty, also applicable to 2018 Atlas models, includes coverage of powertrain components. The 2018 Tiguan arrives in dealerships in Summer 2017. It will be available with an eight-speed automatic transmission mated to a four-cylinder turbocharged and direct-injection 2.0-liter TSI engine that produces 184 horsepower and 221 lb-ft of torque. 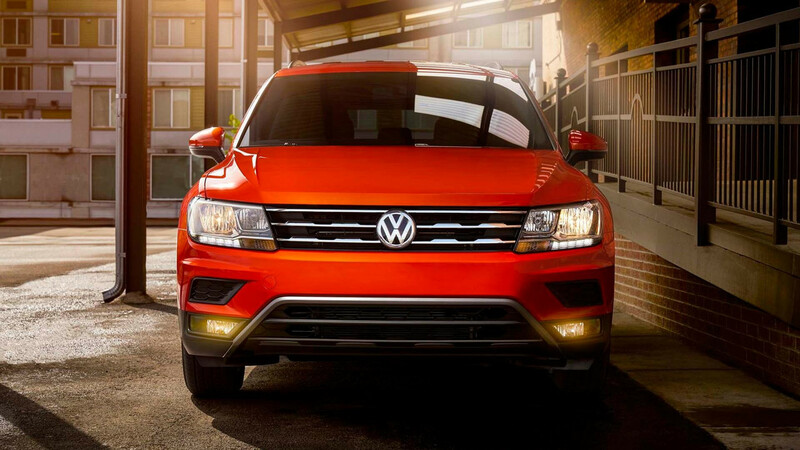 The Tiguan S FWD starts at $25,345 and features a standard four-cylinder turbocharged 2.0L TSI engine. The Tiguan TSI S 4Motion starts at $26,645 and features four selectable modes to maximize grip on a variety of terrains or road conditions. Standard exterior features include 17-inch aluminum-alloy wheels; halogen headlights with LED Daytime Running Lights (DRLs); LED taillights; rearview camera; heated side mirrors; black roof rails; and trailer hitch preparation for hauling needs. Inside, cloth seating with an upscale Rhombus pattern comes standard. The 40:20:40 split second row features sliding and reclining seats that can fold completely flat, using either the levers on the seatbacks or a quick fold mechanism accessed in the cargo area. Standard interior equipment includes a 6.5-inch Composition Color touchscreen infotainment system with Bluetooth® connectivity for compatible devices; one USB port; six speakers; and Volkswagen Car-Net® App-Connect for compatible devices, enabling integration with the three major smartphone platforms—Apple CarPlay™, Android Auto™ and MirrorLink®. Building off of the S trim, the Tiguan SE starts at $29,080. Standard features include an 8-inch Composition Media infotainment system with SiriusXM® Satellite Radio with a three-month trial subscription, Voice Control and two additional (three total) USB ports; VW Car-Net Security & Service; KESSY® keyless access with push-button start; Climatronic® automatic dual-zone climate control; rearview camera with dynamic guidelines; multi-function leather-wrapped steering wheel; leather gear shift knob; leatherette seating surfaces; Forward Collision Warning and Autonomous Emergency Braking with Pedestrian Monitoring (Front Assist) and Blind Spot Monitor with Rear Traffic Alert. The Tiguan SE 4Motion model is available for $30,380. Starting at $32,550, the Tiguan SEL builds off the SE trim and adds a host of advanced driver assistance technologies, modern conveniences and premium design elements. Sitting on 18-inch aluminum-alloy wheels, the Tiguan SEL features an 8-inch Discover Media infotainment system with navigation; power liftgate; remote start; silver roof rails; panoramic sunroof with ambient lighting; and Adaptive Cruise Control (ACC), newly upgraded for use in stop and go traffic. The Tiguan SEL 4Motion model is available for $33,850. The Tiguan SEL Premium builds off the SEL trim and starts at $36,250. The SEL Premium rides on 19-inch aluminum-alloy wheels, and features LED headlights with an Adaptive Front-lighting System (AFS); signature LED Daytime Running Lights (DRLs); rain-sensing wipers; power-folding door mirrors with puddle lights; hands-free Easy Open and Easy Close power liftgate; ambient lighting; heated steering wheel; leather seating surfaces; and a cargo cover. Driver assistance features include Lane Departure Warning (Lane Assist), automatic High Beam Control (Light Assist), front and rear Park Distance Control (ParkPilot) and Overhead View Camera (Area View). Premium infotainment features include the Fender® Premium Audio System and a 12.3-inch Volkswagen Digital Cockpit display, allowing drivers to reconfigure how they view vehicle information. The Tiguan SEL Premium 4Motion model is available for $37,550. Destination fee on all models is $900. Third-Row Seating. Front-wheel-drive models come standard with three rows of seats. 4Motion all-wheel-drive models can increase seating capacity to seven with an optional third row for $500. Driver Assistance. Forward Collision Warning and Autonomous Emergency Braking with Pedestrian Monitoring (Front Assist) and Blind Spot Monitor with Rear Traffic Alert are available on Tiguan S for $850. Panoramic Sunroof. Providing an even more airy and bright cabin, a panoramic sunroof with an ambient lighting surround is available on Tiguan SE for $1,200. R-Line®. 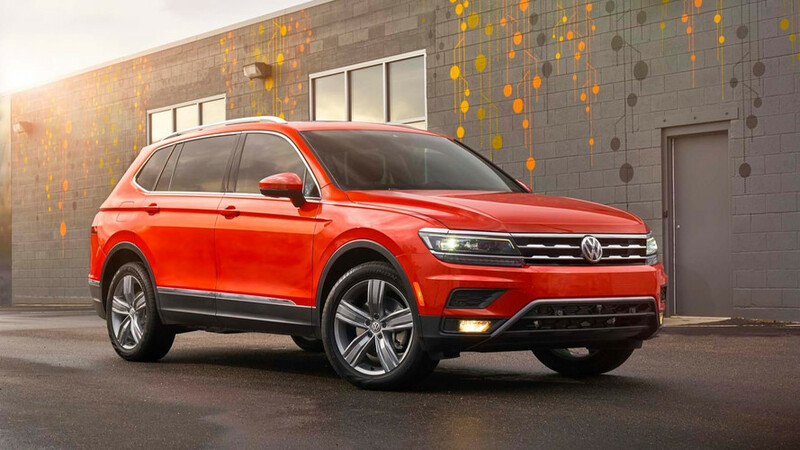 A performance-inspired R-Line package, offering sporty exterior and interior design treatments that amplify Tiguan’s bold appearance, is available on SEL for $1,795 (also includes front and rear ParkPilot) and SEL Premium trims for $1,495. Late availability.